Ever since my initial foray into the world of blogging and food media I've watched the odd fascination with mediocre drink from both the foodists and bartenders alike. Every brand ambassador that peddles their wares is treated as some sort of prophet of things to come. Never mind that any tequila or spirit with a brand ambassador is a dead giveaway for corporate swill. The 76 trombones never arrive!! What has arrived is a false calibration of the consumer's taste for non-traditional tequilas marketed straight to the US market. Some of these are good drinks, but they don't honor the true nature of the agave, and of Mexican tequila conventions. I care not for stories, nor production traditions when it comes to spirits--one of my favorite tequilas is cooked in an autoclave, and the agaves are crushed by a machine. I find magic in both artisan and semi-artisan productions of tequila, so spare me your jackass-drawn-stone-grinder brochure, because it's what's in the bottle. Taste first and ask questions later is what we say here at the T.I.T(Tequila Institute of Technology). There are only two members right now--myself and fellow tequilero Chuy Tovar. We've drunk it all and are constantly vetting my 70+ bottle collection, and when not doing that we drink tequilas we haven't tried. I first discovered Tequila Tapatio at a lonely hotel bar somewhere in the highlands of Jalisco--it was one of 7 tequila bottles on the shelf. It was love at first sip. There are drinks in your life(if you be a romantic)that take over your senses, both playing rhapsodic melodies to your pleasure centers while transporting you to another place. Tapatio Blanco's flavors dance all over your mouth with earthiness, light smoke, and the natural sugars of the agave--you need keep it in your mouth and enjoy the changing sensations as the temperature of the drink warms on your tongue. I sat at that bar and drank two double shots of Tapatio blanco's over the course of an hour without a care in the world. I didn't need to research or hear a pitchman's dull tales to know that this was a special tequila. I've had a bottle on me ever since. I looked at a bottle on the shelf a few months back and noticed a newer labeling on its blanco that had me somewhat concerned. What's up? I thought to look at the label, but was too afraid to face the possibility--corporate acquisition! My Facebook rant got picked up by the LA Weekly when I discovered that Tapatio was coming to the US, and all the same bartenders that had embraced every other tale about every other beverage were now celebrating the arrival of a tequila that most of them never heard of, but this time their enthusiasms would be justified. I even spoke to Susan Karakasevic of Charbay on the phone who assured me that master distiller Carlos Camarena would make the same beverage that Tapatio has always made, and that their distribution would stay small and manageable. That's great news for us two guys who really enjoy tequila as a lifestyle. For the bartenders and food media--yes, this is for real and after one sip you're all gonna be connoisseurs. Let Tapatio's bonafide tequila tradition re-calibrate your taste. This is the only tequila tradition I respect--that of tequila TASTE. But, Tapatio is a semi-artisanal production(all tequila production has some industrialization)--the agaves are cooked in a brick oven, and crushed by a tahona(stone wheel). The fermentation takes place in wooden barrels at Arandas' famous La Altena distillery. 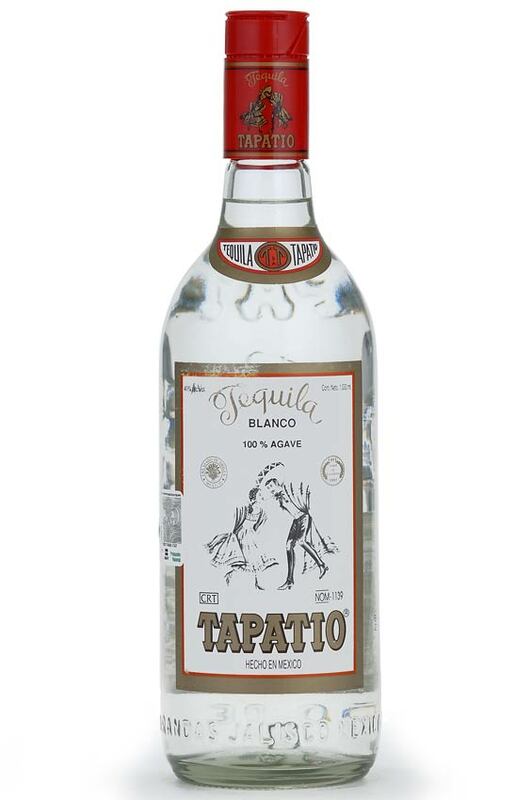 Tequila Tapatio blanco is now available in the U.S--taste the flavor of old Mexico slowly one sip at atime in a cognac snifter, which is the only way to appreciate all this drink has to offer. Bienvenidos old friend. Read about the famous tacos al vapor in La Rumorosa from Tacos Lalo--even 007 would risk his life to have one of these memorable tastes of Baja California. Check it out in my latest Tijuana Si post in the OC Weekly. Was it fate that I began a food blog focused on street food back in 2007? Was it great strategy? Nope--it's just a delicious string of luck that has transformed my calorie intake into something more. 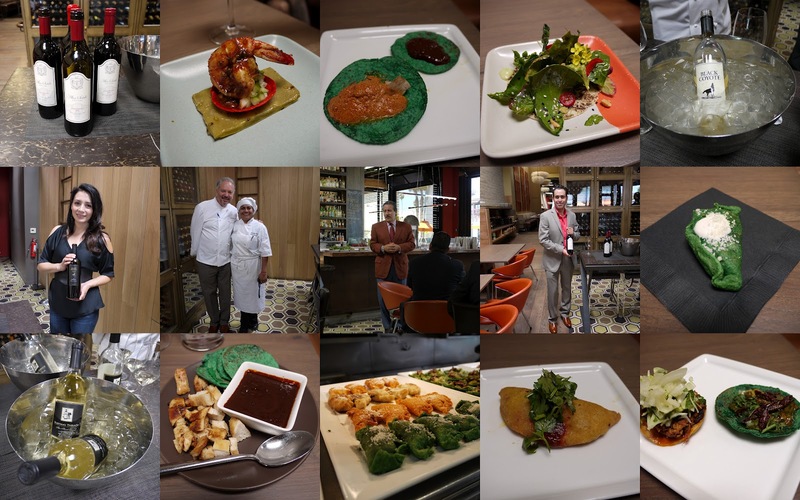 While I'm first and foremost a saxophone player, I sometimes think I endured a rather stressful decade-long gig touring Mexico so that I could eat my way through mi tierra--towards the end of that run, it was only about the food, the culture and the place. The food truck explosion, the proliferation street food shows, Andrew Zimmern and Anthony Bourdain, Jonathan Gold, and the global rise of Latin cuisine--Mexican food conquers America. Everything is coming up street food. This week, after a selection process that lasted a couple of weeks and involved many great candidates, I have been chosen to host the Los Angeles episode of a New Show on the Travel Channel. I will wrap three days of filming later today, and will be able to share more about the show as it's gets closer to the air date--I've also contributed locations for the episode. In the meantime, I have three big events to share with you: I will appear on Bizarre Foods San Diego this coming Monday, 7/16; Alta Med's East LA Meets Napa is back at Union Station on 7/20; and LA Street Food Fests 3rd Annual Summer Tasting is at the Rose Bowl on 7/21, featuring 2 legendary Baja chefs, an iconic seafood stand, Tijuana's most popular taqueria, and a breakout new street stand in Baja. 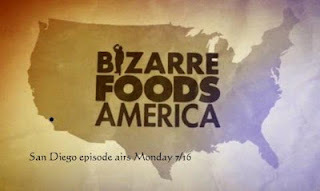 In Bizarre Foods San Diego with Andrew Zimmern, I take Andrew to see my favorite barbacoa man--Paco Perez at Aqui es Texcoco--they we have an old school Texcoco style barbeque in Paco's backyard. We also stopped at maybe the best torta ahogada place on the planet where all the ingredients including the bread are house made. El Gallito is a Chula Vista institution. There's also a delicious crawl through San Diego's superb Filipino restaurants. 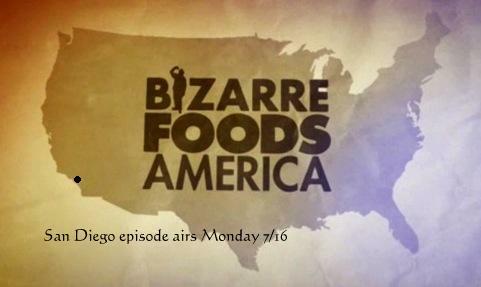 Here's a clip from our barbacoa segment. The event is a fund raiser to help provide affordable medical care for families in need, and is exactly what it advertises--distinguished mom and pops, chef driven restaurants, and taquerias from East LA and the surrounding communities are paired with Latino owned or Latino made wines from Napa. It's the best Latino food and wine event in LA that brings dance, great wines from Napa and Mexico,and pairs them with tacos, sopes, empanadas, birria, moles, ceviche, and more. It's a mixed crowd but the body movement, and spice are extracted from LA's upwardly mobile Latin community. I never miss this party--tacos and wine All Night Long. Check out my ELAMN post from 2010 titled wine, dine, and the conga line. Less than 300 ticket remain, click here to purchase now. 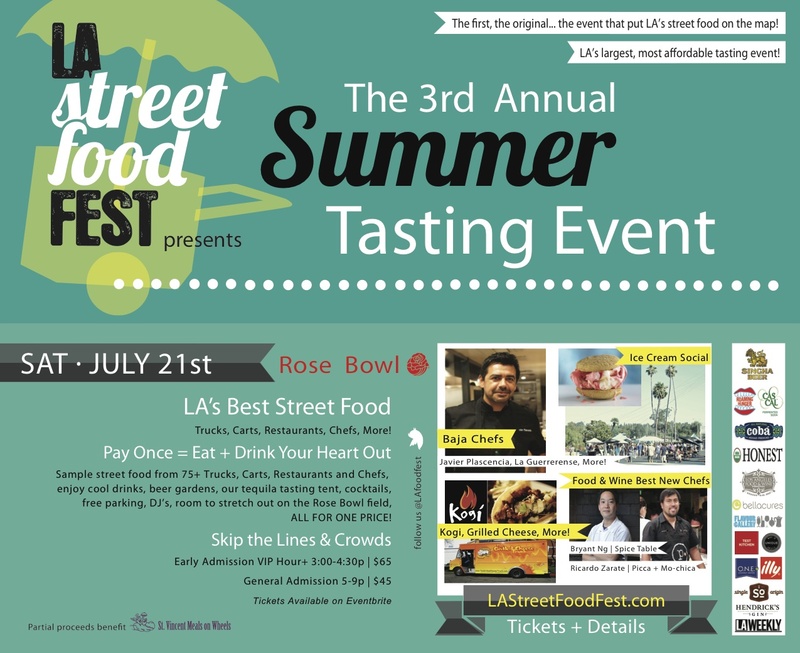 La Street Food Fest on 7/21 at the Rose Bowl. Another event I've never missed is the original LA Street Food Fest and there annual summer tastings. For only $45 you can sample street food the best chefs, Gourmet Food trucks, traditional loncheros in LA; and I'm bringing 5 of my baddass chefs, street food carts, stands, and taquerias from Baja into the mix. $65 dollars gets you an early entry and VIP experience. Each year this event has delivered great food, in abundance. There are more than 75 restaurants, trucks, carts, and chefs. There's plenty to drink at the beer garden, a tequila tasting tent, and cocktails all around to beat the heat. 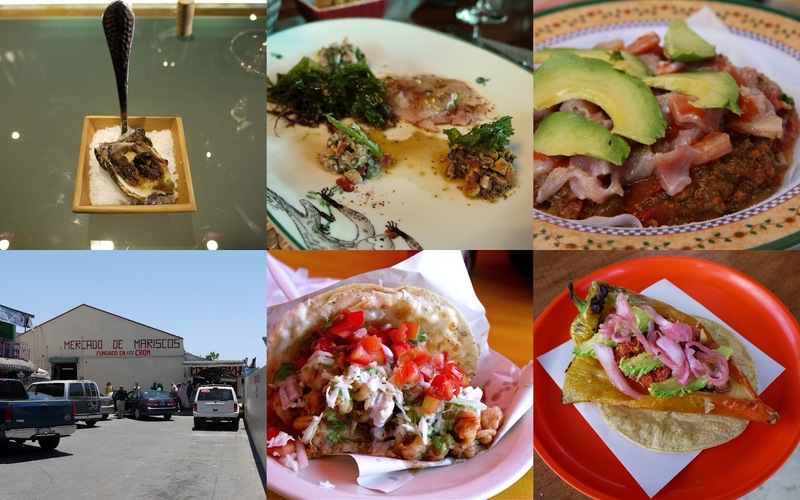 It's worth your money just to experience Ensenada's La Guerrerense, considered one of the best seafood carts in the world; or Tacos Kokopelli, who've been injecting fresh blood into the Baja street food revolution. Chef's Javier Plascencia and Benito Molina are known all over the world for their respective style of Baja cuisine. Mariscos El Mazateno serves up perhaps the best shrimp taco ever made. This day is a celebration of street food in Los Angeles, and we even have LA's own Kogi in attendance. The greatest street food tradition in the US meets the gala street food experience. Come by and say hello, and be sure to get a taste of Baja.